The violins made for this recording form part of the answer to this question. They are based on an original by the Amati brothers from 1595, owned by the Royal Northern College of Music. The neck, fingerboard, bridge and other fittings are matched as closely as possible to paintings and other information from c1600-1630. The bass violin played here was also made by Stoppani some years ago for Paul McCreesh. It is a copy of a 17th century Italian original owned by Mark Caudle, and set up after Praetorius's illustrations in Syntagma Musicum, c 1620. 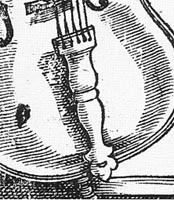 Tailpiece from the Stoppani bass violin. We’re delighted to have complemented this splendid instrument with violins that would have been familiar to the owner of the original. You can also hear the violins and bass featured in the bonus track – Marini’s sonata La Foscarina – available from iTunes. Reaching this point, however, has been far from straightforward, although the journey has been immensely rewarding. In essence the process was simple: choose a maker, decide on a model and agree on the set-up. In fact, only the first of these was easily done: we decided immediately to ask George Stoppani to make the violins. I have worked with him for years as a string-maker, and have come to understand that his approach to historical instruments chimes perfectly with my own, and with the Gabrieli philosophy. I had also been wonderfully impressed by the quality of his instruments that I had seen and played. The second proved to be tougher, and almost brought the project to a halt. There are many instruments of the right period in existence but very few are available to see; many belong to international soloists and some are in private collections. 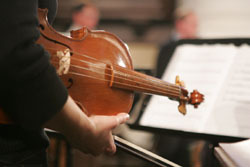 Most others had to be ruled out due to being in poor condition, the wrong size (violin size was not standard in 1600), or from the wrong region of Italy (Monteverdi was said to prefer Cremonese instruments). 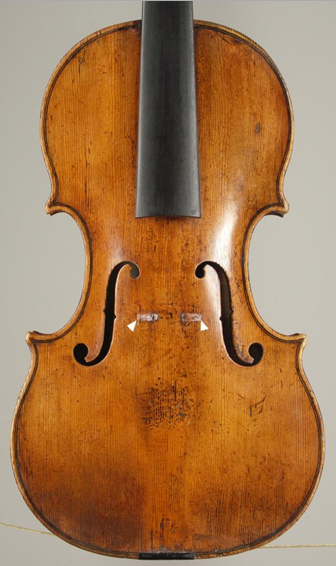 By mid-July we had narrowed the field to 2 candidates: a 1629 Brothers Amati belonging to the Royal Academy of Music, and the 1595 model we eventually settled on. 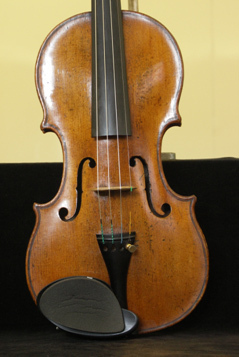 The 1629 violin is beautiful, but it was one of the first of the slightly larger “Grand Amati” design, and therefore anachronistic for the Vespers of 1610. The construction of the violins had to begin with measuring and photographing the original. We had taken all the necessary measurements by the end of July 2005. I was able to take part in one measuring session, and it was a fascinating and painstaking process. Templates had to be used to measure the arching at critical points, and a cunning device known as a Hacklinger gauge, involving a spring and magnet allowed us to measure the thickness of the wood without taking the instrument apart. A detailed photo session completed the work, and George was able to start making the instruments at the beginning of August. At this point, questions about the details of the instruments came into play, and we had to become detectives. Surviving instruments, fragments from museums, paintings and other iconography, musical evidence, literary references and a healthy dose of common sense were all drawn upon to find answers. For example, some surviving instruments have marks where the bridge feet have been placed. In many cases, this is in the standard modern position, level with the f-hole nicks, but in some we find them much closer to the tailpiece. This makes an interesting comparison with many early 17th century paintings, where we often see the bridge in a lower position, especially (though not exclusively) in the work of Roman artists such as Caravaggio, Guido Reni, and Carlo Saraceni. This led us to surmise a connection between bridge position and pitch standard, because Roman pitch was significantly lower than Venetian pitch, and the longer string length that the low bridge position gives is ideal for playing at lower pitch. Since we are using A=440Hz for this recording, we have chosen the “standard” bridge position, although happily this does not exclude future experiments with different positions. The shape of the bridge is also critical, and we based our design on a pattern seen in a number of paintings by Cavarozzi, Gentileschi and Guercino from the 1610s and 1620s. No less a literary source than William Shakespeare also provides us with evidence about violin fittings: his character James Soundpost in Romeo and Juliet (1597) suggests that the soundpost was new enough on the scene to warrant a little satire! We could have continued researching  for years – and no doubt will – but eventually we felt we had answered the critical questions to the best of our ability. The violins were completed and brought down to London on October 10th, to great relief and excitement. We are immensely grateful to George for working at an incredible pace yet with impeccable attention to detail. It has also been very satisfying to be involved with the design process at every stage, and to work with someone so receptive to informed historical debate. 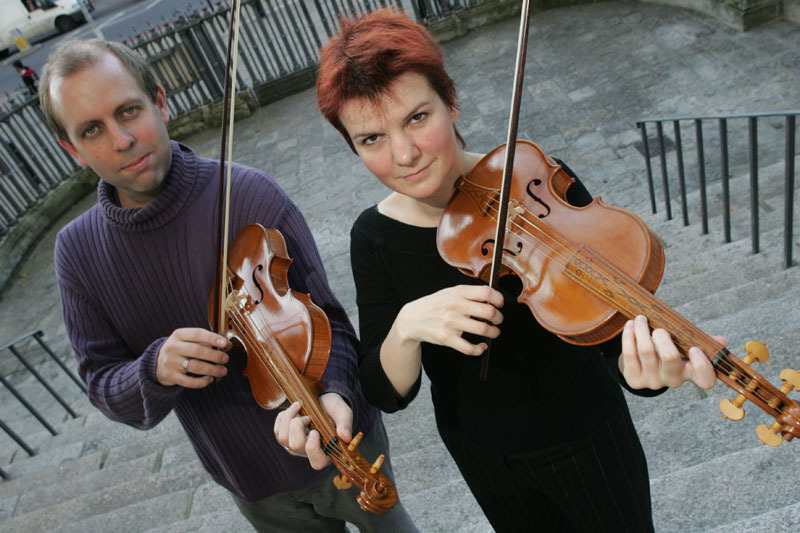 Catherine Martin and I tried the instruments together, and what immediately struck us was how although each had a strong individual character - hers is brilliant and direct while mine is mellower and a little sweeter - when they were played together, the blend was perfect. They belong to the same sound-world, in which violins, although known for brilliance and penetration, were also expected to play as a consort, and in which a strong, speaking articulation was just as important as a free, singing tone. This also brought home to us the great benefit of having a matched pair of instruments, a luxury rarely managed today. We have also found that they complement the sound of the cornets and sackbuts - with which they are so often paired in this repertoire - much better than other models. I hope that, whatever debate and refinements the future of violin research brings, this venture has gone some little way to giving Monteverdi his true voice, and that you can enjoy the fruits of these labours in the Gabrielis' recording of the Monteverdi Vespers. 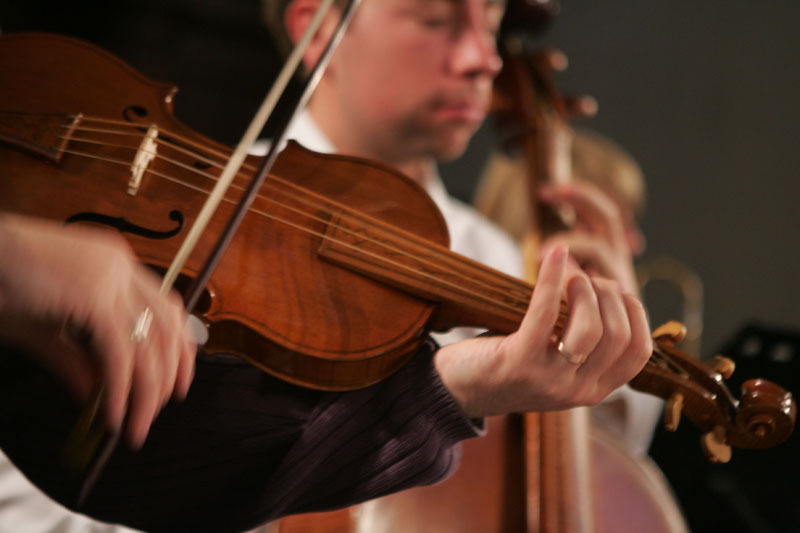 Oliver Webber’s ensemble, the Monteverdi String Band, is currently planning the construction of a full violin band along the lines of Stoppani’s Monteverdi violins. This will involve considerable investigation, the results to be published in due course in the Galpin Society Journal.